Irish Wolfhound "Bronze by Dr. Robert B. Turner"
Specializing in Canine Art for the Purebred Dog Owner. 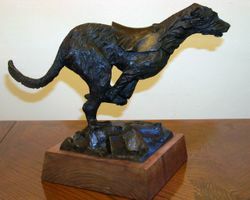 Home > IRISH WOLFHOUND TREASURES > Irish Wolfhound "Bronze by Dr. Robert B. Turner"
This is a solid Bronze Sculpture of a Coursing Irish Wolfhound with blanket created by the late Dr. Robert B. Turner in the 70's. This is the Artist's Proof on an oak base. It is my understanding that only three pieces were created before the molds were retired. Robert Turner was an Irish Wolfhound owner and a University Art Professor and Department Chairman and had a love of Irish Wolfhounds and Scottish Deerhounds. One other casting is available located in the mid west and the asking price is $5400 that piece is also available. Both sculptures are being sold due to retirements and have been loved by their owners. Free Shipping in the USA.